CrazyFaces Face Painting offers professional face painting, body painting, henna, and airbrush services for parties and events in the greater Philadelphia PA area including Delaware and New Jersey. 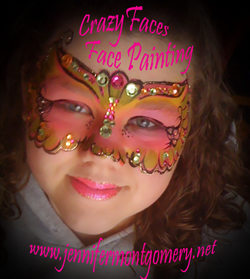 CrazyFaces Face Painting will make your kids birthday party ,corporate event, fair, festival,Bar or Bat Mitzvah a colorful memory! Fully insured, professional, reliable and best of all FUN!